Title: Organic matter preserved in 3-billion-year-old mudstones at Gale crater, Mars. The prospect of life outside of our own planet is an irresistible mystery to humanity, and it’s no wonder we care so deeply about what scientific secrets are hidden in our solar system and beyond. Mars, Earth’s planetary neighbor, may contain some clue as to whether life is possible outside our sphere, and scientists have just uncovered a key ingredient to life’s possible presence on Mars: organic matter. Organic molecules are those containing the element carbon, excluding some small carbon-containing molecules, such as carbon dioxide. While not exclusive to living organisms, organic molecules are absolutely fundamental to life on Earth. The discovery of such molecules is not proof of life on Mars, but it gives scientists a much better idea of whether extraterrestrial life is even possible. Researchers collaborating on the Curiosity Mars rover mission have discovered organic matter in a 3-billion-year-old crater on the planet using instruments housed on the rover. They used evolved gas analysis (EGA) and gas chromatography-mass spectrometry (GC-MS) to analyze sediment samples for organic molecules. In EGA, the sample is heated to extremely high temperatures in an oven (up to 860 °C, or 1580 °F). As the sample heats up, it will release compounds as gasses. Researchers can measure the temperature at which certain compounds “evolve” into gas, and then direct that gas into a mass spectrometer to measure the mass of the compound (Figure 1). The mass allows scientists to determine an elemental formula, indicating whether it’s organic. 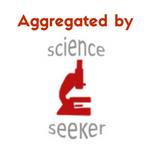 They can also separate the sample into its individual components using GC and, similarly, measure the masses using MS. Figure 1. EGA diagram. The sample is heated in a chamber up to 860 °C. Compounds are released in the gas phase at certain temperatures. These compounds are measured, and their elemental formulas determined, using mass spectrometry. A mass spectrum is taken for every increase in temperature, so the intensity of each compound can be tracked as the temperature rises, creating a profile for a single compound. These spectra are representative of what the data might look like for a given compound. In GC-MS, the released compounds are separated before MS analysis, which can provide more quantitative results. 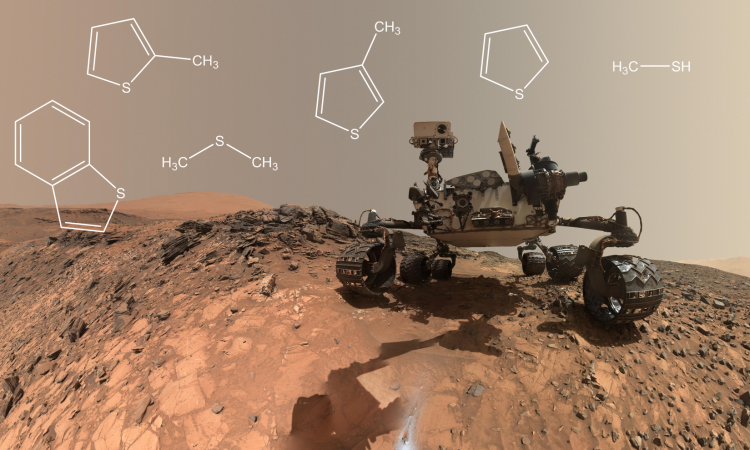 Previous experiments had suggested that chlorobenzene and chloromethanes were present, but possible contamination and chemical reactions during heating reduced the confidence that these compounds were of Martian origin. These suspicious compounds were evolving into gas at lower temperatures, so in this experiment, the researchers only considered data collected above 500 °C. Analysis of the EGA data supported the presence of a variety of organic molecules, such as thiophene, 2- and 3-methylthiophenes, methanethiol, and dimethylsulfide (Figure 2), based on their evolution temperatures and masses. They also found multiple compounds containing a benzene ring, such as benzothiophene. Figure 2. Structures of organic molecules found on Mars based on EGA results. GC-MS analysis confirmed the presence of thiophene and 2- and 3-methylthiophenes, but the measured abundance was 10 times lower than in EGA analysis. This could be due to differences in how the samples were processed between instruments, but it could also mean that the values determined by EGA were inflated by unknown compounds on the surface of Mars that turned to gas at the same temperature. Based on the EGA results, the researchers calculated a conservative estimate of total organic carbon (TOC) in the samples – between 10 and 100 nanomoles of carbon. On earth, TOC measurements are made to determine water purity, for example, but in this case it gives researchers a general idea of how abundant these organic molecules are, especially when comparing samples from different locations on Mars. The question now arises: what do these results tell us about Mars and its history? Geographically, samples from the Gale crater on Mars, believed to have once been a lake, showed greater and more diverse organic signals than other regions. Thinking far back in time – billions of years – scientists can estimate whether this region had more organic matter to begin with, or if the organic matter in other regions have degraded over time by radiation or erosion. The authors used previous literature to hypothesize what factors may have contributed to the varying amounts of organic matter, even within the Gale crater. Cosmic radiation likely varied based on location, affecting degradation, and certain chemical properties of organic molecules could have preserved the matter over time. For instance, layers of macromolecules could protect organic molecules deeper within the planet, chemical reactions with inorganic minerals in the rock could protect the organic matter, and the sediment itself could be less susceptible to degradative influences. Mars scientists don’t know yet the source of this organic matter, whether it comes from ancient life, rock formations, or transported from a meteor. This finding presents further evidence that Mars was once, or perhaps still is, habitable to life. It also suggests that if these secrets can be uncovered in the uppermost layers of the planet, there may be more to discover deeper beneath the surface. Marina is a PhD candidate studying analytical chemistry at the University of Illinois at Urbana-Champaign. She studied journalism in college in the Pacific Northwest, and she loves mountains, trees, dogs, and NPR.